I am never one to rave about my photos. But this, in my eyes, is a one in a million moment. This photo was not altered at all...when I saw it I thought of Jurassic Park! Mija Jolene, you're so lucky to live near nature at it's best. Man, those pelicans are HUGE! Thanks for taking your camera out today. What a fantastic photo! Linda, you are welcome! :) I am just so happy to see them flying and healthy..we have had terrible 'red tide' in our oceans recently and so many birds and sea lions perished from eating the toxic blooms :( Things seem to be improving, but the red tide is still somewhat visible. great picture of nature's beauty. lucky for you enjoying it close hand!! marita - thank you ..how true I am fortunate. I was just spending time visiting your blog! So beautiful. I will visit often. I am literally sitting here with my mouth open!! That picture is amazing and I can't wait to show it to my husband and kids tomorrow. As long as you hold the copyright, you should contact a few birding magazines. I am fascinated and stunned and a little breathless. 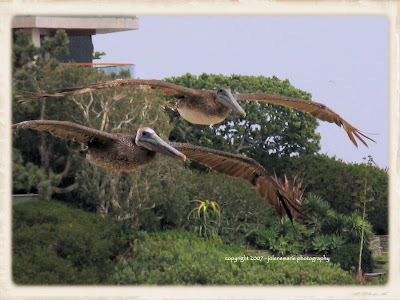 I see Pelicans flying overhead so often at the beach, but never close enough to see facial expression! Look at their eyes and beaks. They truly look ancient and bold. You have captured a rare moment!! I would love to submit this photo somewhere ..but I am unsure yet where to do so. I love heading over to the coast and seeing the pelicans. Great photo! Oh, and I just knew that you would love that house when I passed by it. Wow! What an awesome shot!! The focus on the birds is so great! What a great catch! Dave and I were at the beach last week and were watching pelicans. I made the comment that I found them fascinating because they look so prehistoric. Your picture is awesome! With the background it is VERY "Jurassic Park"
http://wildbirdonthefly.blogspot.com/. I don't know if it will help, but it looks like they have lots of links to lots of birding info. Dagny, Tammy, Gene, Kim - I am so happy that everyone is enjoying this cool photo! I still can't believe I was lucky enough to capture it. As soon as I noticed all the pelicans I challenged myself to get a 'good shot in flight' - since I have captured so many pelicans just sitting. Because I am up on a cliff while at Little Corona the pelicans fly so close it feels like I can reach out and touch them...it is awesome. I thought of cropping out the home on the cliff in the background....but just left things as is....the only thing I did do was lighten up the photo a bit since it was a gray and somewhat foggy day. Your photo is great Jolene. Thanks for letting your blog readers see your great shot! I love the movement in the photo. britt-arnhild...thank you! Yes, I agree regarding the movement...and look at that wing spread! tami..hi! Thanks. There were actually a few fly by's that came closer but I couldn't focus my camera quickly enough! Besides, I get so awestruck seeing them so close up I just stare! LOL! wow, that is such an awesome shot... when I first saw it I thought jurassic park, too. They look so unreal... amazing! misty - I am so happy that you had a moment to see the photo! Thank you for stopping by. I look at the pelicans as well and say to myself.."they look so unreal"...but trust me...they were REAL. LOL!